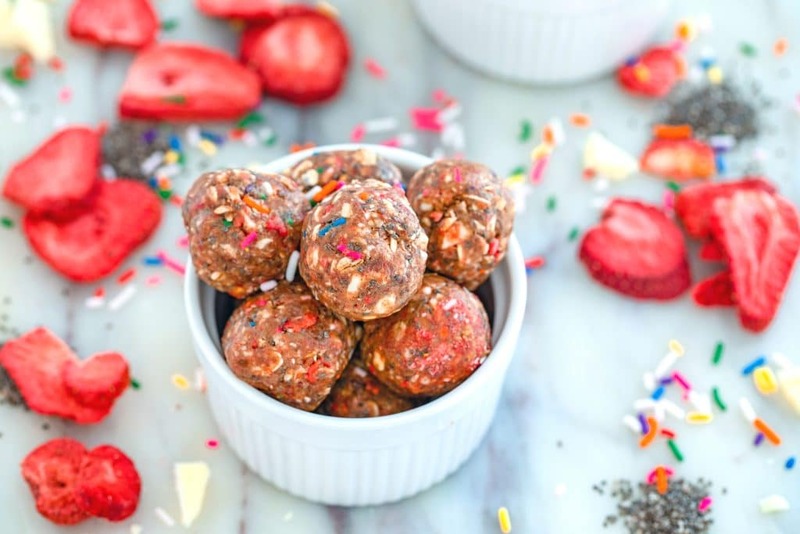 Delicious, healthy, and packed with energy-boosting properties, these Strawberry Funfetti Energy Bites will get you through those mid-afternoon energy slumps. Raise your hand if you’re currently lacking energy in a major way. I’ve been chugging coffee like it’s my job (wouldn’t that be fun if I actually got paid to drink coffee?? ), but it’s still not quite enough to get rid of these January doldrums. It’s cold, it’s dark, and… it’s cold. I honestly shouldn’t even be complaining because it really only got frigid last week and we’ve had next to no snow in the Boston-area, so at least we’re not surrounded by gross brown/grey/yellow snowbanks (yet! there’s still plenty of time!). I’m even still able to take my dog on her afternoon walks since the ground is cleared of ice and snow (guys, we bought my dog boots. But omg her boot walking skills are not quite up to par just yet). So, I really can’t complain! But I will because it’s still January and like I said, pretty freaking cold. Also, how could I call myself a New Englander if I didn’t complain about the weather?? I generally have the most get-work-done energy first thing in the morning and late at night. Because I get my energy at each end of the day, that results in me not getting enough sleep at night. And getting quite sluggish in the afternoon. BUT I absolutely can’t take afternoon naps or else I’ll legit never go to bed at night. I’ve also been trying really hard not to drink too much coffee in the afternoon. Enter energy bites. I’ve obviously seen these guys around the internet for some time, but they never really appealed to me (admittedly, when they’re called “energy balls” they appeal to me even less). Until I was visiting my sister last month and she had me pull a bag of them out of her freezer and pop them into her kids’ lunchboxes. I tried one, realized how delicious they are, and decided I needed to make my own ASAP. If you’re a regular reader of my blog then you know me. I wasn’t about to make a batch of boring old energy bites. I wanted mine to have pizazz. I wanted mine to have rainbow sprinkles. And white chocolate. And strawberries. So, I did it (insert “shrug” emjoji here) and there’s no looking back. 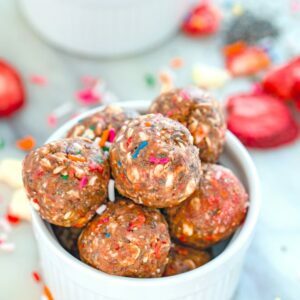 If you’ve never made them before, you should know that energy bites are incredibly easy to make. You simply blend all of the ingredients together, roll into balls, and chill. And then they’re ready to go the second the mid-day gloom sets in. Once everything is in the bowl, simply mix together. I used my stand mixer to make it super quick and easy, but you can really just put everything in a bowl and stir together with a wooden spoon. Then roll the mixture into golf ball-sized balls. 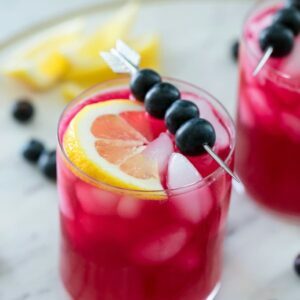 Technically, you can dig in right away, but I recommend chilling these energy bites for a bit before getting your fix. But then, by all, means, go to town. I think I succeeded in creating an energy bite that is both delicious and also actually kind of pretty to look at. 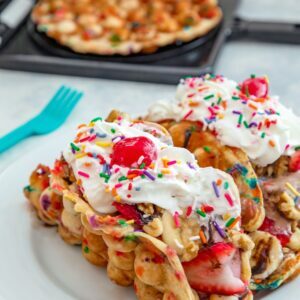 Obviously you don’t have to add the rainbow sprinkles in (some people don’t really like the taste of sprinkles, which I totally get), but they add such a fun brightness to the day. Especially these gloomy January days. And if you’re like me, you not only need an energy boost in the afternoon, but you need a happiness boost, too. These guys bring it to me with their look and their flavor. Those may not be fresh strawberries in my funfetti energy bites, but they’re still “real” strawberries and just a little reminder that spring is coming soon! In case you’re wondering, you can get freeze dried strawberries at some grocery stores, but I purchased a big box of these ones (affiliate link) and have been slowly making my way through them. And white chocolate? How can that not make you happy at any time of day?? 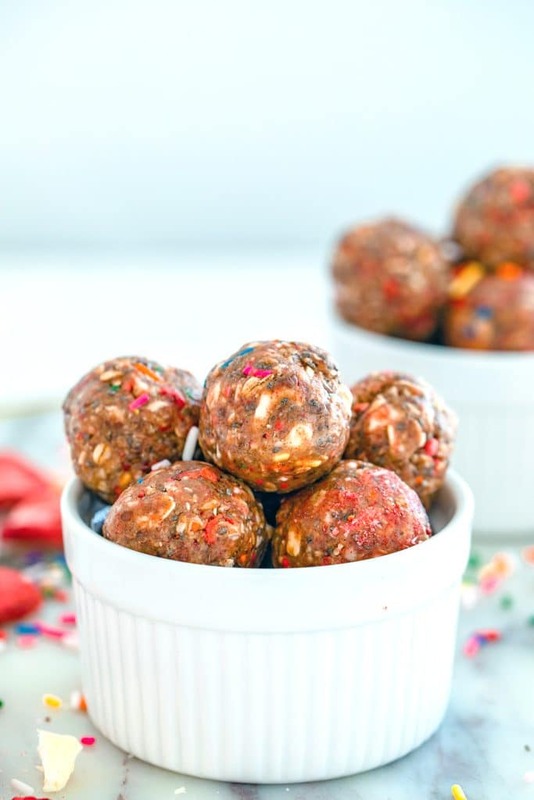 You might be wondering just where the energy comes from in these energy bites (besides the fact that if you’re like me, you get your energy from funfetti!!). The oats, ground flaxseed (please note that ground flaxseed is much healthier for you than whole since your body can absorb the nutrients better), and chia seeds all have energy-boosting properties thanks to a great combination of protein, fiber, and fats (omega-3s!). They’re also a snack that will keep you fuller for longer. So, no more snacking until dinnertime! 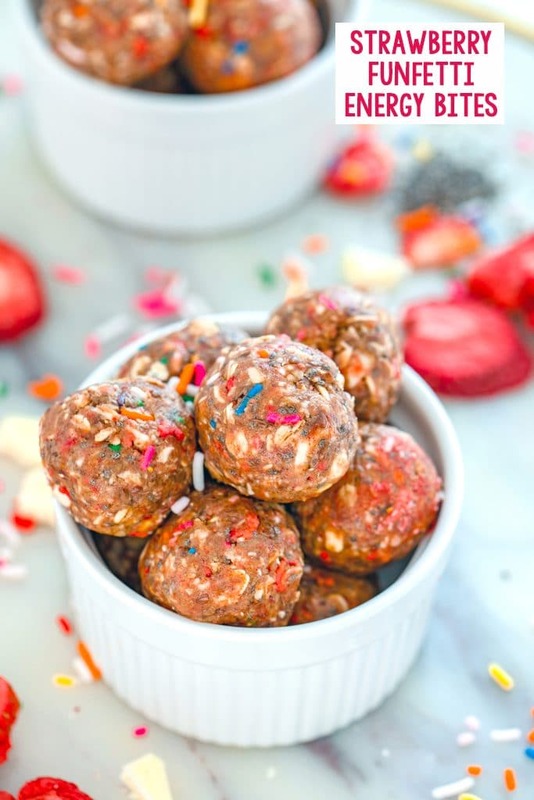 I’ve been popping a couple of these strawberry funfetti energy bites into my husband’s lunch every day, too, because I know it’s a tasty way he can get some whole grains into his diet without even realizing it. Technically, he probably eats far too much chia because I sneak it into our smoothies and anywhere else I can every change I get. Oh well, there are far worse things to overdose on! The other great thing about these energy bites is that you can store them in the freezer and basically always have them on hand. 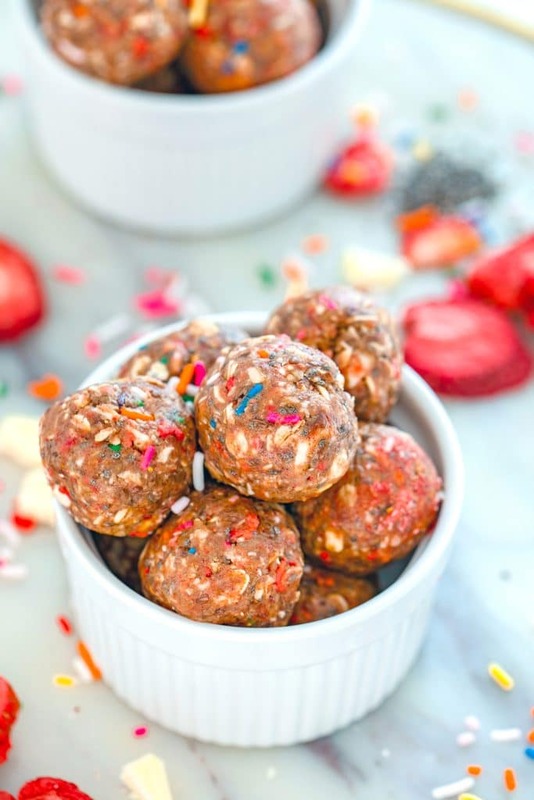 Considering you can make a big batch of these in just minutes, they’re pretty much the easiest snack ever. Oh, and when you’re in a rush in the morning? Energy bites are the perfect grab-and-go breakfast. And now I can happily power through the rest of the afternoon with a little bit of chocolate, a lot of funfetti, and all that other healthy stuff, too. That’s hashtag balance. What do you find yourself reaching for when the mid-afternoon slump hits? If you’re looking for more fun healthy-ish snacks that can also double as breakfast, check out my Chocolate Peanut Butter Cheerios Granola Bars and my Coconut Chia Dragonfruit Smoothie Jars. I’m also loving these Sweet Potato Oat Bars from Running Into the Kitchen. 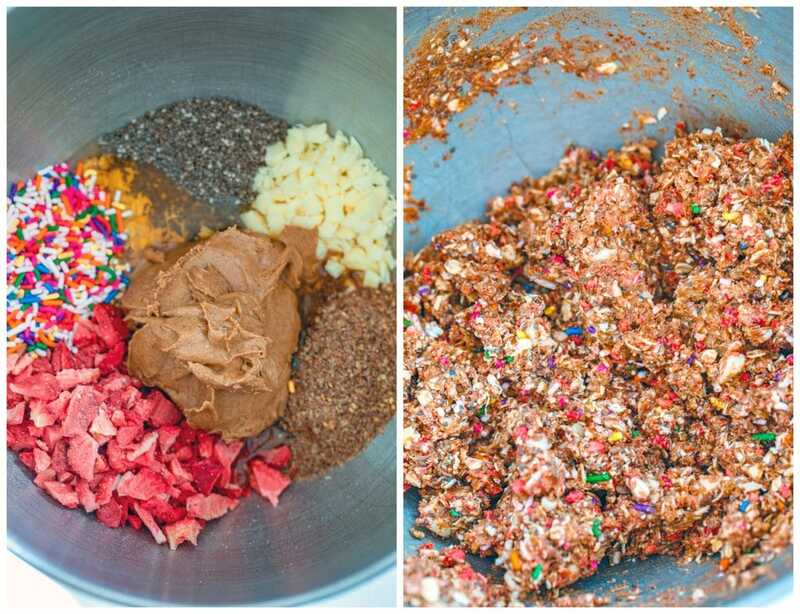 Add all ingredients to a large bowl and mix together until well combined (you can use a stand mixer if you have one). Roll the mixture into golf ball-sized balls. Place energy bites in an airtight container and keep stored in the fridge for up to a week. You can store in the freezer for longer. 7 Responses to "Strawberry Funfetti Energy Bites"
These are great. I need them to keep from napping in the afternoon! LOL. The flavor really stands out, and you only need one. Yummo! 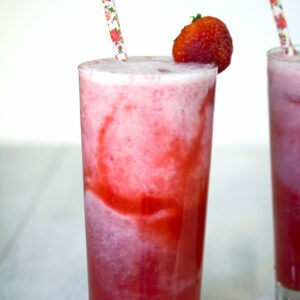 Love that you added strawberries and sprinkles! These looks great! Oh gosh, I need these. I always suffer from the afternoon lost of energy. 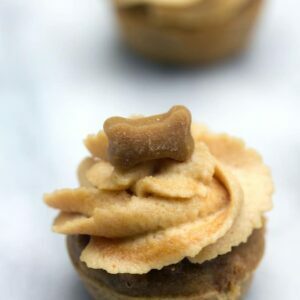 These little bites will definitely pick me up! My children are always ranting about some tasty evening snack. They’ll love this for sure! Especially with those sprinkles. These are so cute and I love the dried strawberry too. I can see these would be a great afternoon pick me up! Are there really people who don’t like sprinkles? They are such a fun idea to add into these! I love energy bites. To me they seem like cookie dough!